Thanks to Learning Resources for providing us a New Sprouts® Grill it! set for free so that we could share it with you. All opinions are mine! A few weeks ago we were sent the New Sprouts® Grill it! set by Learning Resources to try out. 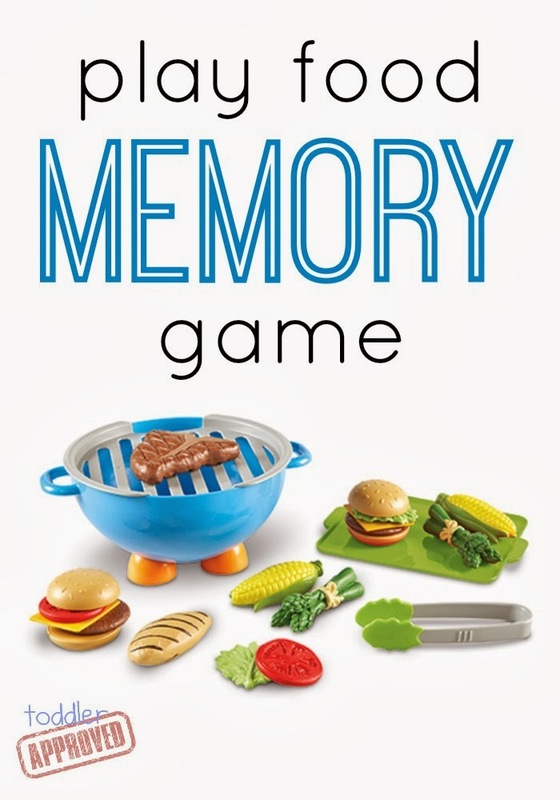 Not only did my kids grill steaks and build burgers, but we also played a simple play food memory game using the grill that was so much fun (scroll down for the details). My kids love dressing up, acting, and doing various pretend play activities, so this Grill It! set was right up their alley. The three things I love about this set are the tongs, how well made everything is, and how great the grill is for storage. You can read more below. My absolute favorite piece of the set was the pair of tongs. My almost 3-year-old struggles with fine motor skills and I love finding simple ways to help her strengthen her hand and finger muscles. Tongs are perfect and she had a blast picking up different food items with the tongs, "grilling" them, and then moving them back to the tray. I also love how durable and well made each item in the set is. The kids have carried all of the items around the house for weeks, dropped them, thrown them, and the baby has even chewed on them... and they still look great and aren't damaged at all! The grill has a removable grate that makes it super easy to store the play food inside of the grill (covered by the grate) until you are ready to use it. This makes clean up easy for my kids... which means that they clean up, instead of me! We nicknamed our game "Guess what's on the grill?" It is great to practice memory skills in a fun way. As kids get older, they are asked to remember more things at once (multiple step directions, phone numbers, spelling their name, etc). You can help them exercise their memory muscles in simple ways at home. One way is by playing memory games. For our memory game we just use four items from the grill it set, along with the grill and grate. To get started I chose four items and put them on the grill. Then my almost 3-year-old daughter and I talked through the name of each item that I'd placed on the grill. After we talked for a minute or two, I told her to close her eyes and I hid the grill and removed one item from it. Then I put the grill back (minus one item) and had her open her eyes. When she looked at the grill again, I ask her "what happened?" She was quickly able to tell me that one object was missing from the grill. I asked her "what's missing?" and she tried to remember. Sometimes she guessed correctly, sometimes she didn't. As we played again and again and she became more familiar with the objects on the grill, she was more likely to guess correctly. After she was able to guess one missing item, then I started taking away two items... to see if she could remember both items. It was a simple & fun little guessing game. Along with the play food memory game, we also practiced being grill masters and taking orders! Having my daughter take my order and then try and make food the way that I wanted was a hoot. I did the same thing for her. Putting together the burgers with cheese, tomatoes, and lettuce on top (like I asked), was another good memory strengthening activity because she had to remember what I said and what order I wanted things put on my burger. In addition to these silly games, we mostly just played and played... stacking, pretending to eat, etc. 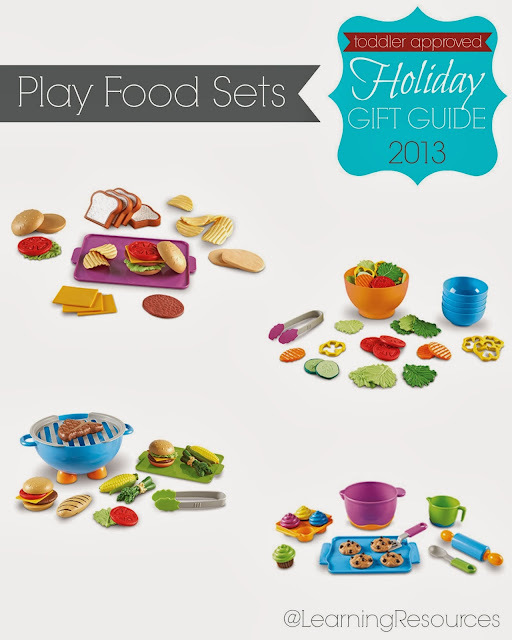 I am definitely adding pretend play items and dress ups to my must-buy list for the holidays. Here are a few of the new items that Learning Resources just started offering this month that could make for cool gifts for your little kiddos (click on the links below for more details). If you want to check out more from Learning Resources you can find them on Facebook, Pinterest, Instagram, and Twitter... or scroll through their catalog on their website. Do you have any other favorite pretend play items that are on your "to buy" list? If you want to check out more Toddler Approved pretend play favorites, drop by our Pretend Play pinterest board. 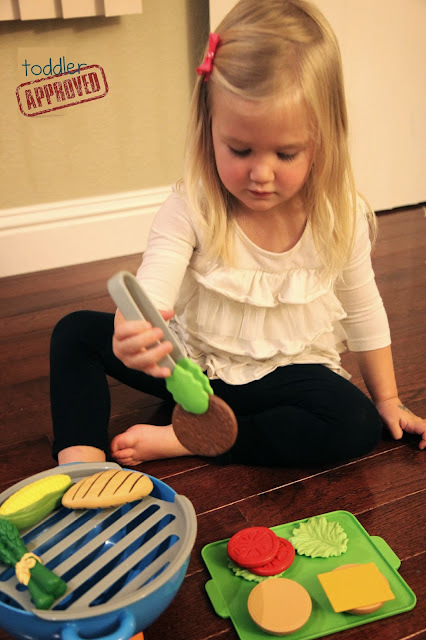 My absolute favorite for this time of year is our Thanksgiving Feast pretend play activity. Also, don't forget about this week's giveaway. We have a super cool DVD giveaway that is part of our Toddler Approved Gift Guide. You can win six DVDs... including a few new Holidays films! Go here to enter now! That's hilarious! I loved when you let your daughter take your order and fill it! What a great game. I love how you are so creative with your teaching! I'm a fan!